Reading and Book Signing Tonight! Tonight, Friday, November 2, from 7 to 10 pm! 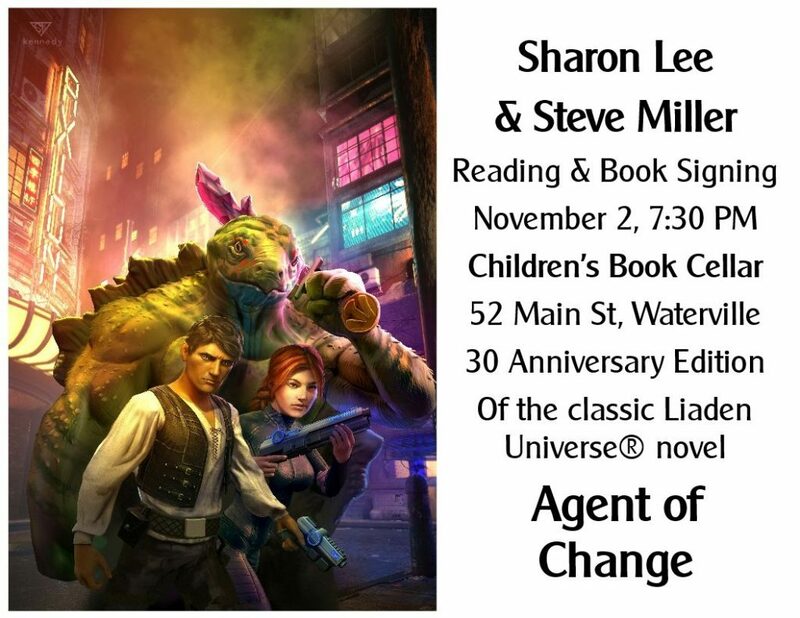 Sharon Lee and Steve Miller will be reading from and signing copies of the thirtieth anniversary edition of our very first novel; space opera classic AGENT OF CHANGE, at the Children’s Book Cellar in Waterville. Looking forward to seeing you there! wish I could be there! I’ve been to that store, and if you get even a small crowd the place will be FULL. Here’s hoping for crowds! Regarding the book cover, I have to say I am underwhelmed: it is nice and colorful and promises plenty of action, but… ValCon looks like a wax dummy and Miri, well that isn’t what Miri looks like based on descriptions in more than one of the books. the hair is good, the face is pleasant, but the, er, how do I say this, uh, the bust is not what is described in the books. and as for (I assume that is) Edger, I don’t know what that thing is in his hand, but it reminds me of a rubber stamp. Hope you’ have lots of visitors at the signing tonight! Previous Previous post: Val Con and Miri’s 30th Anniversary News!